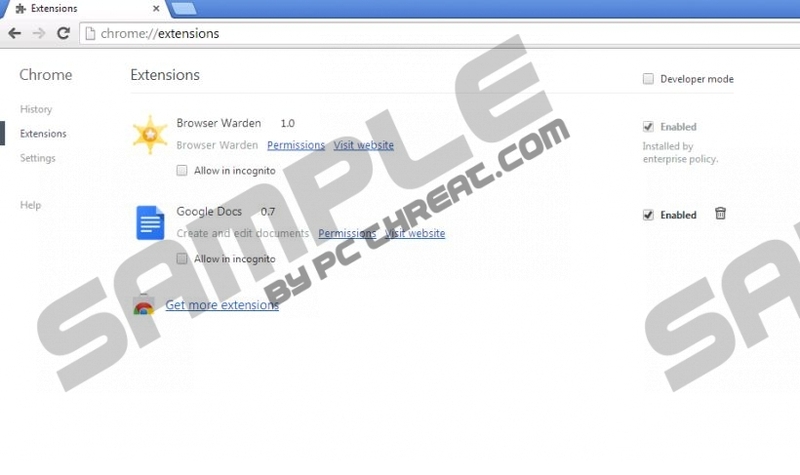 Browserwarden Ads is an adware application that comes from the Smart Apps family. There are two main types of programs from this group – one type promises that it will help you save money on your online purchases, the other type promises to protect your browser from malicious websites. Browserwarden is the latter. However, both types of the applications display commercial advertisements, so they are both classified as adware. Hence, you are strongly recommended to remove Browserwarden Ads from your computer because adware apps are often exploited by cybercriminals, and you should avoid any potential security threats. As it has been mentioned above, Browserwarden Ads is part of Smart Apps family. It also means that it is another version of such applications as Browserkeeper, Coupon Waterfall, Discount Dragon and so on. The official homepage for Browserwarden at browserwaren.com claims that “malicious sites that infect your computer with malware and viruses are traps for even the most savvy web surfers. Browserwarden keeps you out of harm’s way by warning you before a dangerous website can cause damage.” The thing is that Browserwarden Ads can block specific websites if you want to avoid them. However, that comes at a cost. Browserwarden installs an adware helper called BenchUpdater onto your computer. Both programs come together bundled with freeware, as a direct download link at the official website is currently dead. BenchUpdater is an adware helper, and it connects to a remote server behind your back to update Browserwarden Ads. If that were not enough, this adware helper also modifies Windows hosts file without your permission by adding the following line to it: 54.225.95.126 hjjjegfhiceggepdokloeepnhlfnedkk. This modification allows Browserwarden to connect to remote advertising servers, and before you know it, you are flooded with a galore of annoying advertisements. Upon the installation, Browserwarden Ads will add extensions to all browsers (Google Chrome, Mozilla Firefox, Internet Explorer), and these extensions will generate commercial advertisements, pop-ups and discount coupon offers when you visit online shopping websites. It is also possible that Browserwarden Ads will display Jollywallet banner at the top of some websites, and Jollywallet is a notorious adware application. It is true that Browserwarden Ads are more annoying than dangerous, but you should not rule out the possibility of malicious exploitation. You can never know what kind of content is embedded into the ads, so it is for the best to uninstall Browserwarden and all the other freeware applications that might be currently running on your PC. Follow the manual removal instructions below to get rid of Browserwarden Ads, and do not forget that after manual removal you are strongly recommended to scan your PC with a licensed antispyware tool. Invest in a computer security tool of choice if need be, and make sure all the potentially dangerous programs are gone. Click Settings on Charm and go to Control Panel. Select Uninstall a program and remove Browserwarden. Go to Uninstall a program and remove Browserwarden. Open Add or remove programs and uninstall Browserwarden. Open Start menu and go to Computer. Select Local Disc (C:) and go to Windows folder. Open System32 and double-click drivers. Go to etc and open hosts file with Notepad. Delete the lines below # 127.0.0.1 localhost and # ::1 localhost. If you have any further questions on Browserwarden Ads removal, or your computer security in general, you can always leave us a comment. Quick & tested solution for Browserwarden Ads removal.